This recipe came together really quickly when I first made it a few weeks ago. 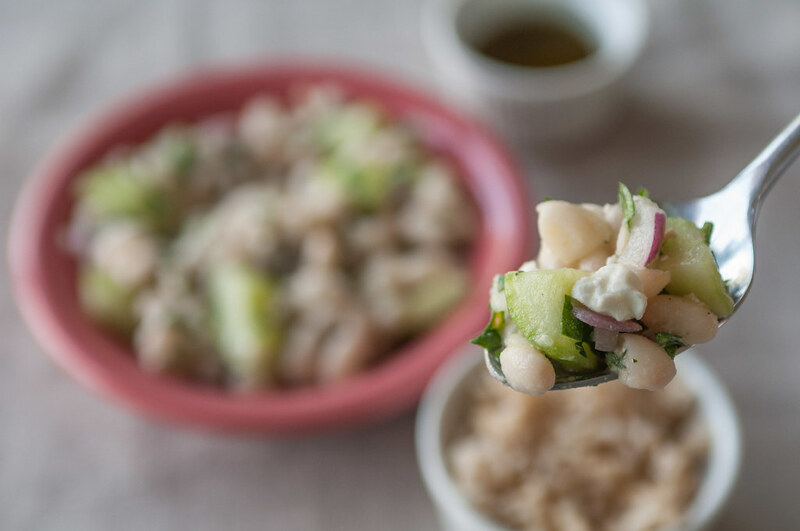 It’s full of classic, clean flavors you love (and probably have on hand) in a vinaigrette, and has everything you need going on in a salad texturally–creamy, crunchy, hearty. It’s a good way to use inexpensive, fresh ingredients to create a filling meal that requires no cooking. Can I get an Amen? I made the mistake this week of choosing five dinners that required either the stove, the oven, or both. I should have changed up one of them for this salad. Or any salad. Do you want to know why I didn’t? 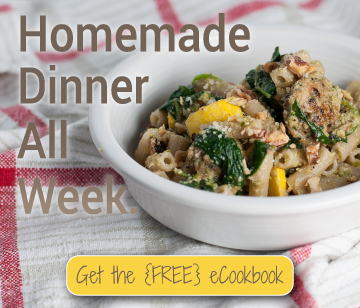 Because I had already taken the picture of this week’s menu for Monday’s What’s for Dinner post, and I felt it would be disloyal or cowardly or something to change it up, having to admit in that post that my photo wasn’t accurate. All about honesty over here. 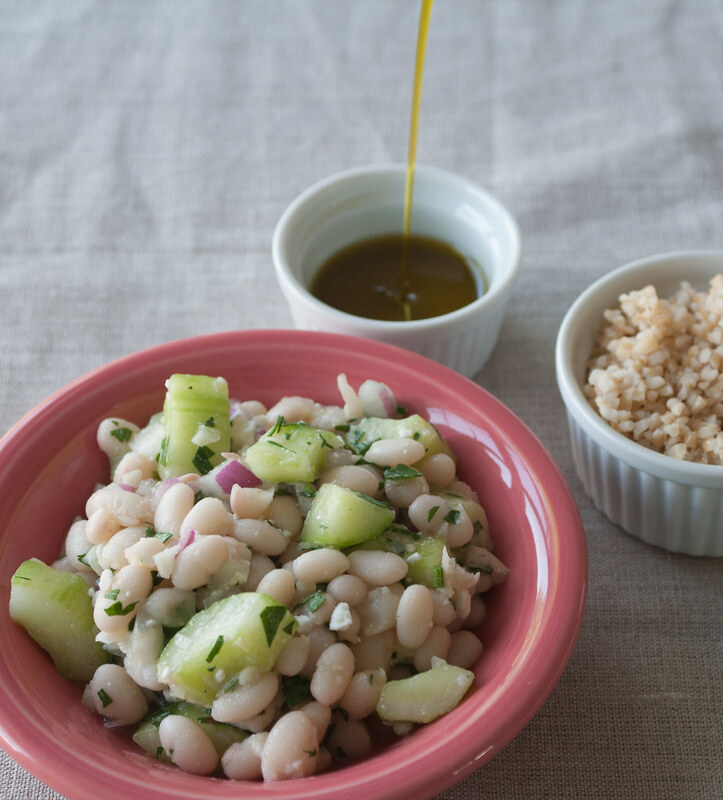 You may notice the bulgur as a grain base for this salad. I know it’s not gluten free, don’t worry. Bob’s Red Mill hasn’t fooled me yet. On a spectrum of all the gluten containing foods one could eat, though, this would be one of the least offensive. I avoid gluten mainly to avoid processed wheat flour, and it’s plain to see that bulgur has not been milled and processed to the extent that it resembles Elmer’s glue when combined with water. If you are gluten sensitive or intolerant (or just prefer to stay completely away from it), you could easily substitute quinoa, probably the quickest cooking alternative. I chose bulgur because it softens into an edible form just by soaking in hot water. Yeah, I was impressed, too (and apparently all I had to do was read the package I had purchased several times before). If you’re unfamiliar, bulgur is a very light, flaky, fluffy, brown-ish grain when it’s cooked. It’s extremely inoffensive, and it soaks up the surrounding flavors so you don’t get any big bland bites. The hottest days of summer are probably yet to come for most of the country, so maximize your pool or beach time and minimize your time in the kitchen! A main dish salad that makes for excellent leftovers! 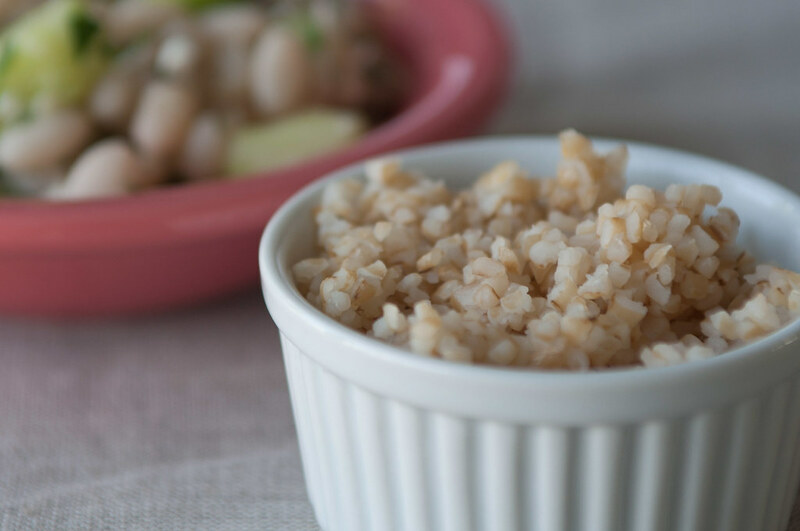 Place dry bulgur into a heatproof bowl or pan which has room for the bulgur to double in size. Pour an equal amount of boiling water (from the stove or microwave) over the bulgur, stir, and let sit while you prepare the salad. Combine red onion, garlic, white or red wine vinegar, olive oil, white balsamic vinegar, and 1 t Kosher salt in a small bowl. Stir and set aside. 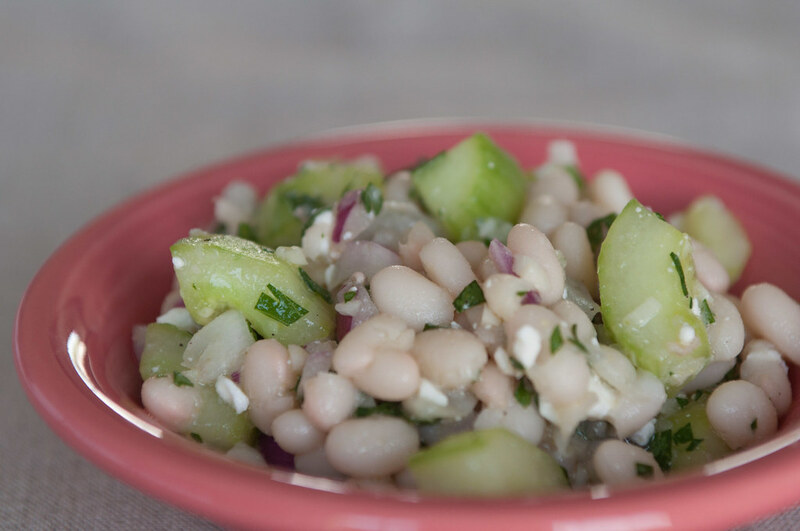 In a large bowl, combine cucumbers, feta, parsley, and white beans. Stir gently to mix without smashing the beans. Pour the onion and garlic dressing mixture over the salad ingredients. Sprinkle with fresh ground black pepper and stir to coat. Fluff the now finished bulgur with a fork. 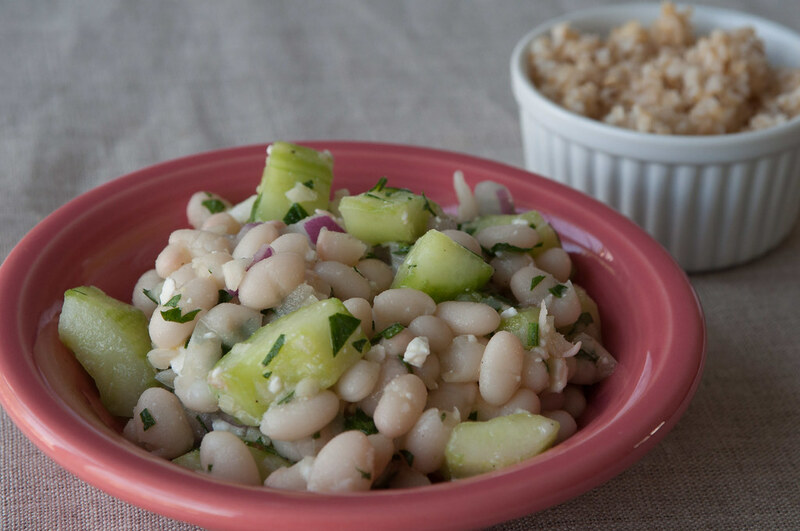 Serve a large scoop of salad over a half cup of bulgur. Garnish with any remaining parsley and a lemon wedge, if you have them around. Check the bulk bins for bulgur wheat, if available, to only buy the exact quantity you need. I used to scoff at Ina’s requirement for “good quality olive oil” in every recipe, but now I understand. Save your store brand for heating, but if you can get your hands on something better–with a cleaner finish and taste–for salads and drizzling, it’s worth the extra money. I love this local store, and I believe they ship nationally. So this was under the vegan section but contains feta cheese? What would you suggest as an alternative?